Lifechanger is a new section on Gizmodo in which we laud the everyday objects that make life oh so better. 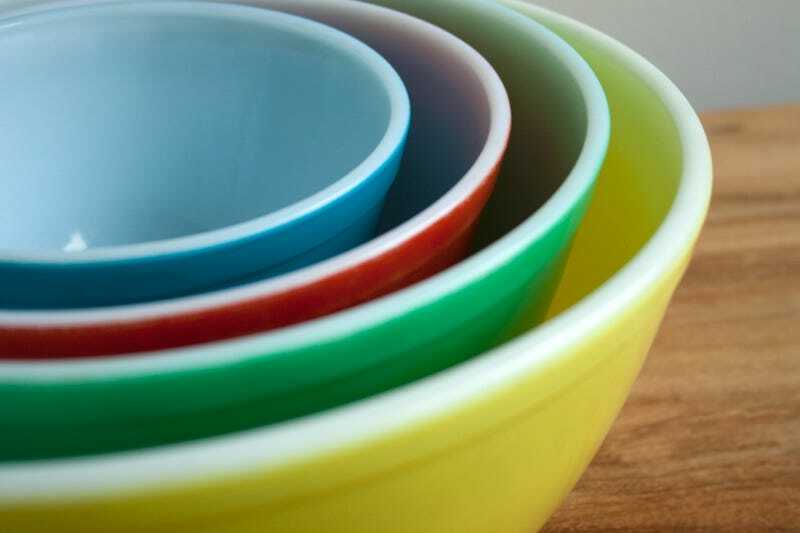 In its debut, we're going to talk about a classic culinary icon: Pyrex Colors mixing bowls. Around 1900, way before silicone spatulas and carcinogenic lids, there was a company named Corning Glass Works. They made a low-expansion glass lantern for use on the railroad—specifically solving the issue of a hot lantern shattering when struck by cold rain or snow. Apparently, the lanterns were so durable that demand waned and Corning Glass was forced to diversify. Then in 1913, when an engineer's wife spotted the glass' culinary potential and baked a cake in a half-sawed Corning Glass Works battery container, the company realized their new direction. The first Pyrex-branded bakeware arrived just two years later. My particular passion begins in 1943, with the release of the 400 Series Primary Color Mixing Bowls Set. In my corpulent, Midwestern eyes, this series of four simple nested bowls is the epitome of design. Four glass bowls of varying sizes, each marked with their own timeless primary color (of course green is not technically a primary color, but it's allowed to stay out of sheer awesomeness), each contained in another in another—no space is wasted, no gimmick championed. Each piece is built for utility, and somehow, nothing about the package inherently implies "industrial"—there's an obscene amount of casually present character in these simple bowls. The painted surface is soft on the hands but rock solid against a whisk. The white interior allows the colors of your mix to pop with accuracy. And, of course, the different bowl finishes become a subconscious cue, a chromatic language, if you will, as to the size of each piece. Is this your smallest bowl that you have in your hand? No, it's the red one, the second smallest. I grew up mixing in Pyrex's bowls. My mother called them her favorite wedding gift she'd never asked for, and she uses the same set to this day. There are countless other stories like hers, as evidenced by a huge aftermarket following—just check eBay where vintage sets go for far more than anything on the market today. These bowls were crafted to last generations, a build quality that's tough to find in almost any contemporary product. Can you, perchance, imagine using your first gen iPhone in 30 years? It's a downright tragedy that Pyrex no longer makes their Colors line. It's been replaced by a lifeless clear bowl set with colored plastic lids. But whenever they release the inevitable, limited edition redux, you can bet the sets will move like nesting hotcakes...though I think I may prefer the version I already have. It's already got a whole generation's worth of experience under its belt.